Some people are worried about harvesting rhubarb because they've heard that the leaves are poisonous. While it's true that rhubarb leaves contain oxalic acid, they are only toxic if ingested. In other words, you don't need a radiation suit or a haz-mat team to be able to harvest your rhubarb crop. It's fine if your skin comes in contact with the leaves. Just don't eat them. Do NOT think about harvesting rhubarb the same year that you plant it. The plant needs time to develop an extensive root system. If you harvest the first year, the plant won't grow well and stalk production in the following years will be greatly diminished. The year after you plant rhubarb, you can harvest 3-4 stalks. The plant is still developing its root system, and yields in future years will be greatly reduced if you harvest too much. After the plant has been in the ground a couple of years you can harvest your rhubarb normally. Rhubarb is ready to be harvested when the stalks are at least 12 inches long. The thickness of the stalk doesn't really matter, just the length. You can grasp the stalk with your hands and pull it up, twisting it as you pull. You can also use a knife and cut the stalk at soil level. It is not recommended to cut below the surface of the soil as you may accidentally damage the crown. Once you have harvested the stalks, cut off the leafy portion at the top of the stalk and cut off the base. Both the base and the leaf should be discarded. What's left is perfectly edible and will resemble a trimmed celery stalk. The harvested stalks will keep for several days in the refrigerator if left whole. If they go unused for more than a week, the stalks will become slimy and spoil. Fresh rhubarb can easily be frozen for future use. 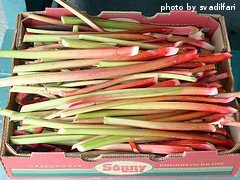 Immediately after harvesting rhubarb, chop up the stalks and put them in an airtight bag or container. Store the container in your freezer for up 6 months. 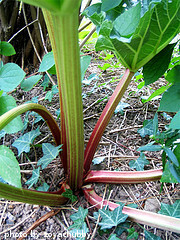 Remove any flower stalks you see emanating from your rhubarb plant and discard them - they are not edible. By getting rid of the flowering stalks, you are focusing the plant's energy on edible stalk production. Most mature rhubarb plants will be able to be harvested for approximately 2 months. When the stalks fail to reach 12 inches tall and are about the diameter of a pencil, stop harvesting. This will allow your rhubarb plants time to gather and store enough nutrients to produce another bumper crop of stalks the following year. In general, stalks that are harvested in early spring are more tender. Stalks harvested later in the growing season are usually tougher and more sour. Reserve the early spring harvest for pie and cobbler making. Use later season rhubarb stalks for sauces and jams. After the first hard frost in the fall, remove any remaining stalks from your rhubarb plant(s) and discard them. Then apply a 3-4 inch layer of mulch over the crowns. Grass clippings or leaves work well as mulch. This will help protect the plants over the winter and add nutrients to the soil.